Super Savings Item! 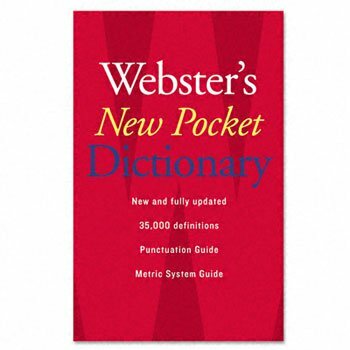 Save 38% on the - Webster's New Pocket Dictionary, Paperback, 336 Pages by Reg at Pear Farm. MPN: PRTHOU1019934. Hurry! Limited time offer. Offer valid only while supplies last. New and fully updated edition. Provides a quick check of the spellings and definitions for people on the go. Features over 35,000 definitions. New and fully updated edition. Provides a quick check of the spellings and definitions for people on the go. Features over 35,000 definitions. Includes pronunciations, syllable divisions and inflected forms for all headwords. Detailed punctuation guide lists basic rules with example sentences. Reference Book Type: Dictionary; Language(s): English; Number of Pages: 336 pages; Binding: Paperback.